The first challenge with this wee-dainty construct is the materials. The original was made from some sort of vintage 1920’s schmada. Unfortunately, I’m fresh out of those. I checked a couple of bins in the garage to see if one had appeared via the sort of random wormhole action that produces fabric I don’t remember buying and ribbon in colors that I can’t imagine needing, but no such luck. Le sigh. 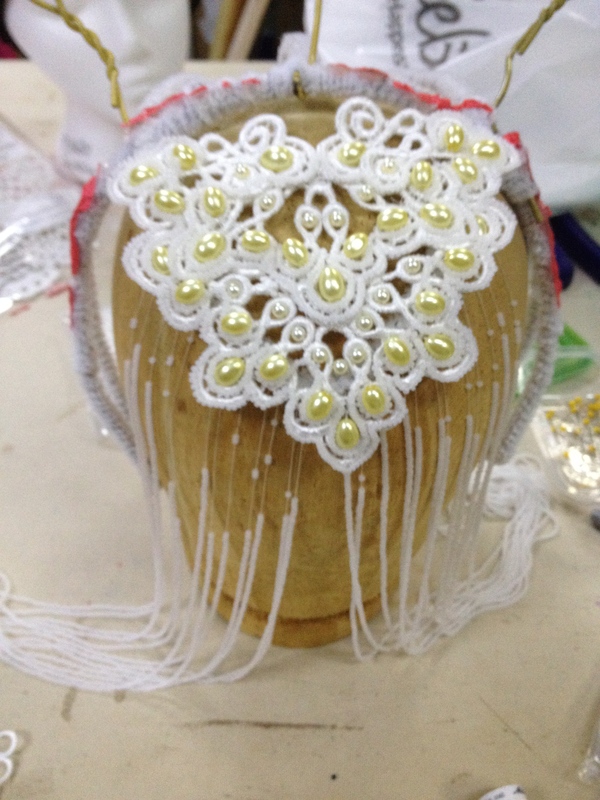 So I bought a bag of small lace appliques from CheepTrims. These have enough heavy scallop on the edge to give me the shape I want. 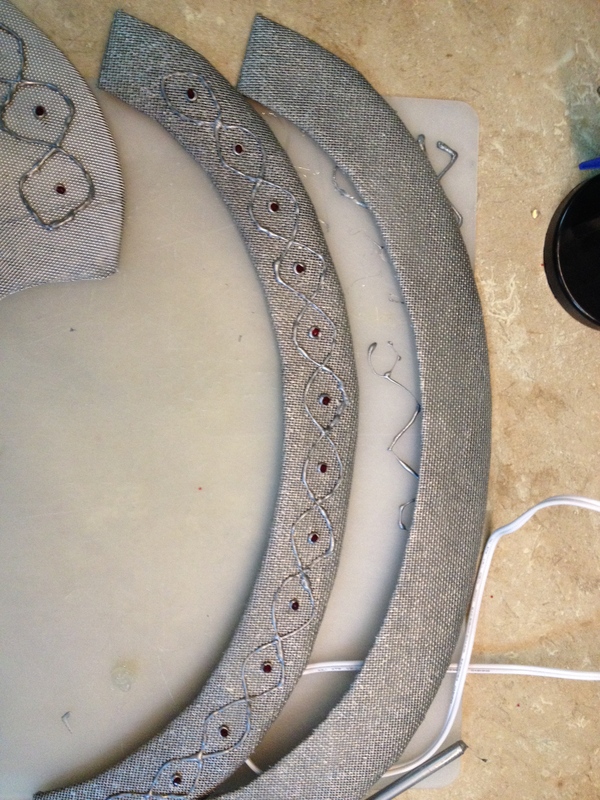 I started laying them out in a pattern that nominally resembled the original and sewing them together. 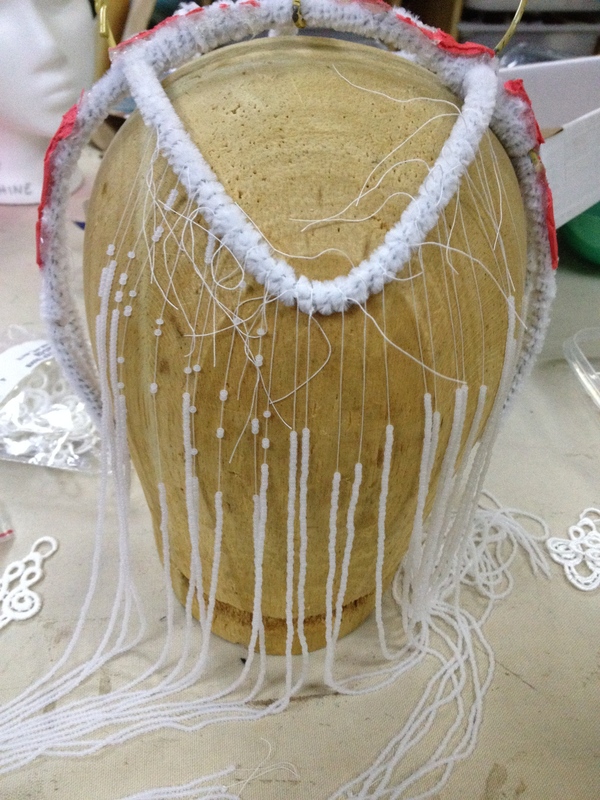 Then I started adding little white beads around the edge. 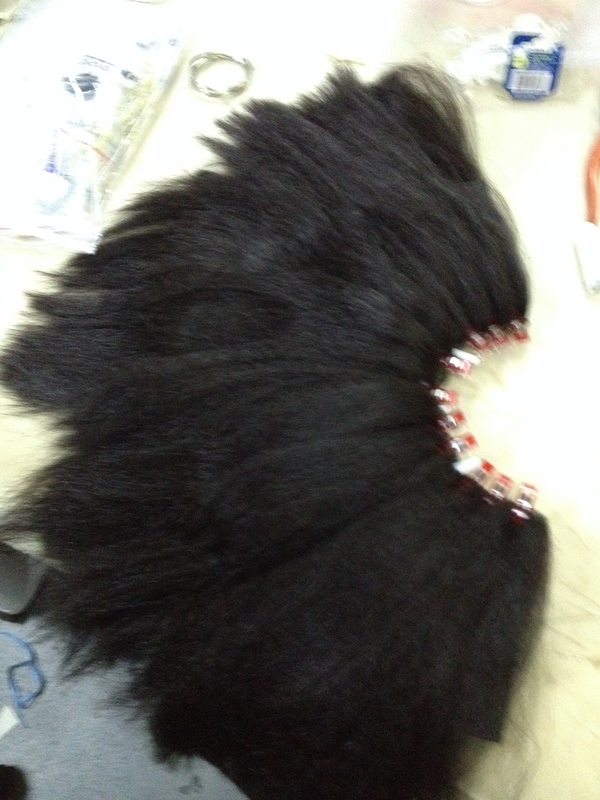 This bit will continue getting acquiring more and more beads over the upcoming weeks. 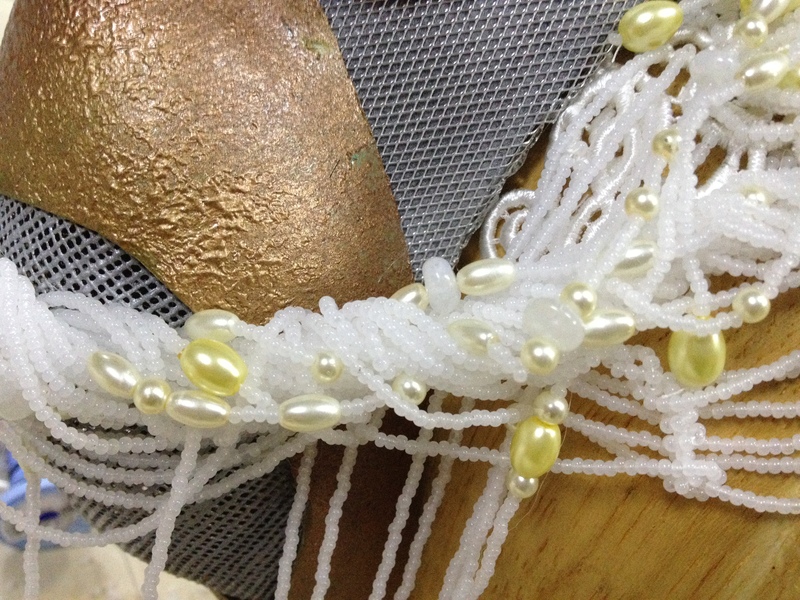 Pearls in off white and somewhat yellowish will be added into the mix. 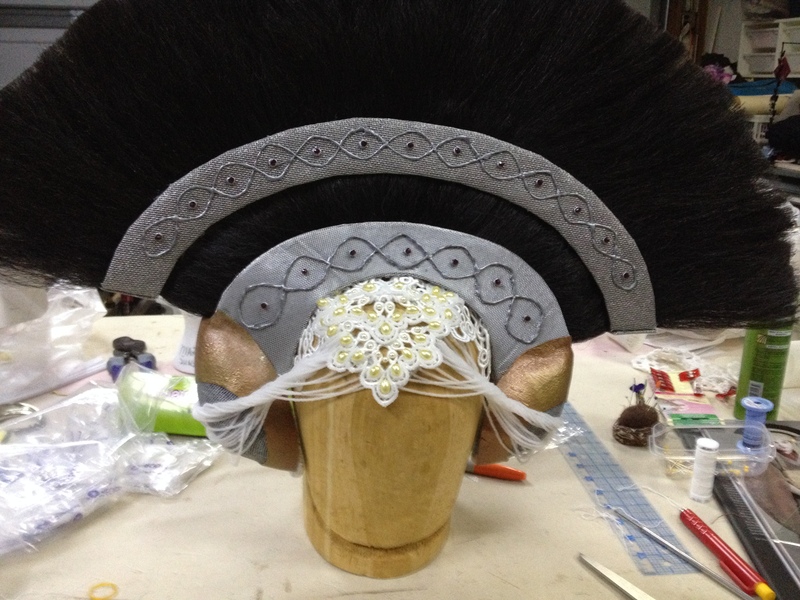 The headdress base I need looks something like this. I just need to figure out how to get the bits of craft foam and former bouncy-balls to stay on a human head, with an enormous mass of hair sandwiched between them. 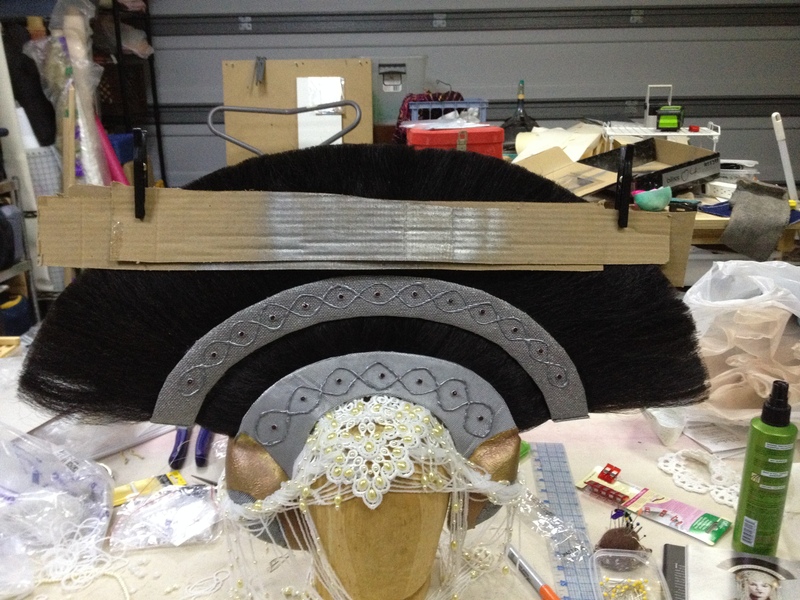 I decided to go with the two-hangers-and-some-craft-foam approach to millinery. 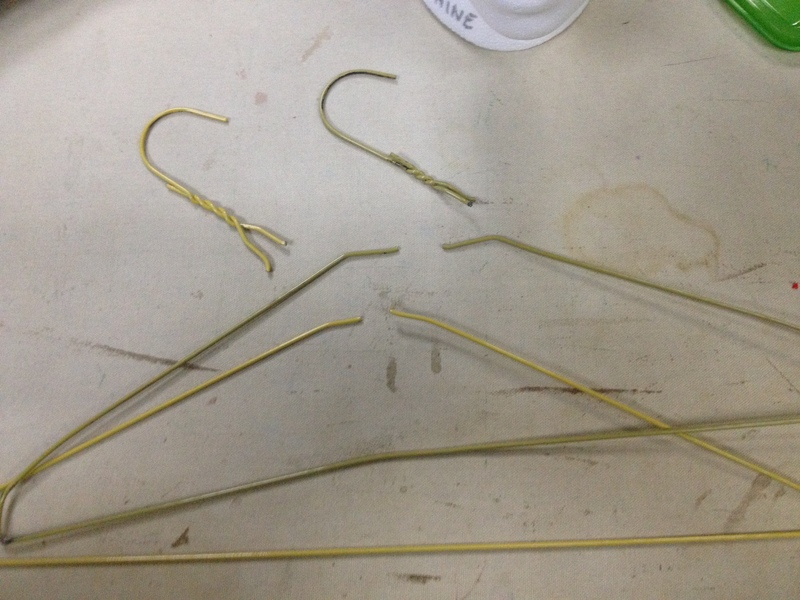 Hangers, successfully decapitated and ready to become a frame. 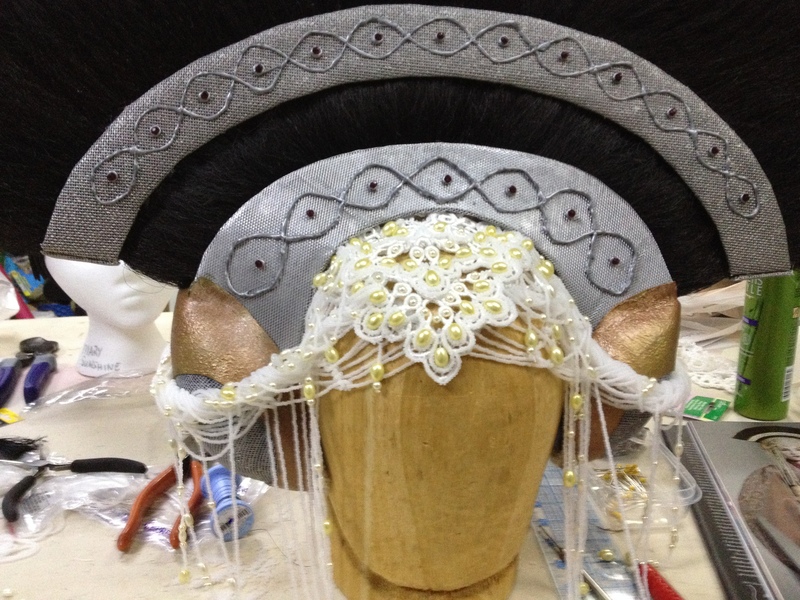 I want this headdress to be really stable on the head in spite of its height. I thought about hennins like this one and this one, which appear to have a frame that goes below the ear. (I’d just covered the Late Middle Ages in History of Costume, which is probably the only reason this crossed my brain.) 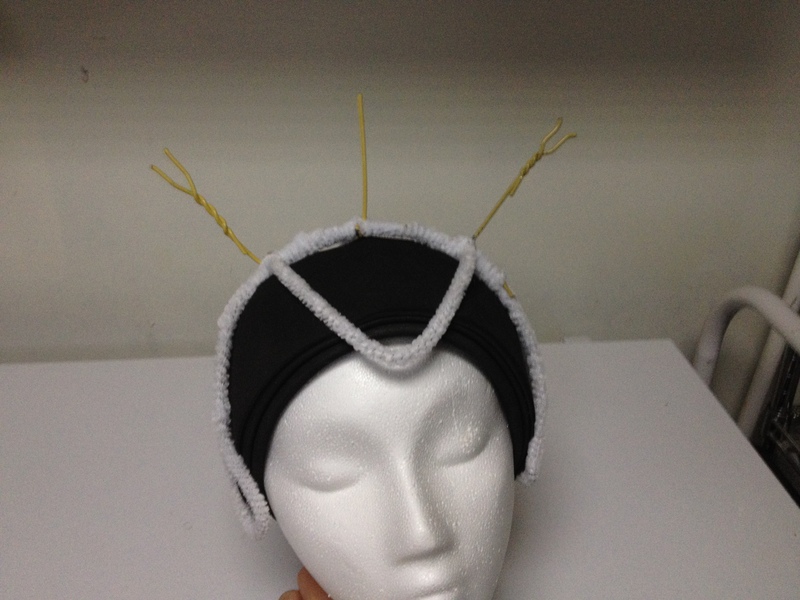 Since this headdress can hide a support like that (as can many of the “earmuff” style hennins), I thought I’d give it a go. 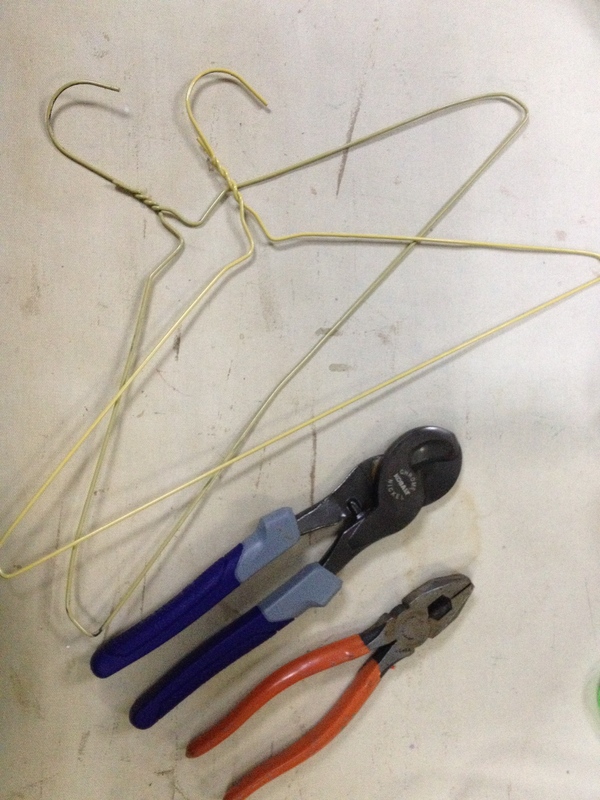 The first hanger is bent into a banana shape that loops under my ears. This is surprisingly comfortable. Then I remembered that I have a smaller head, and rebent it so that it goes lower under my ears. 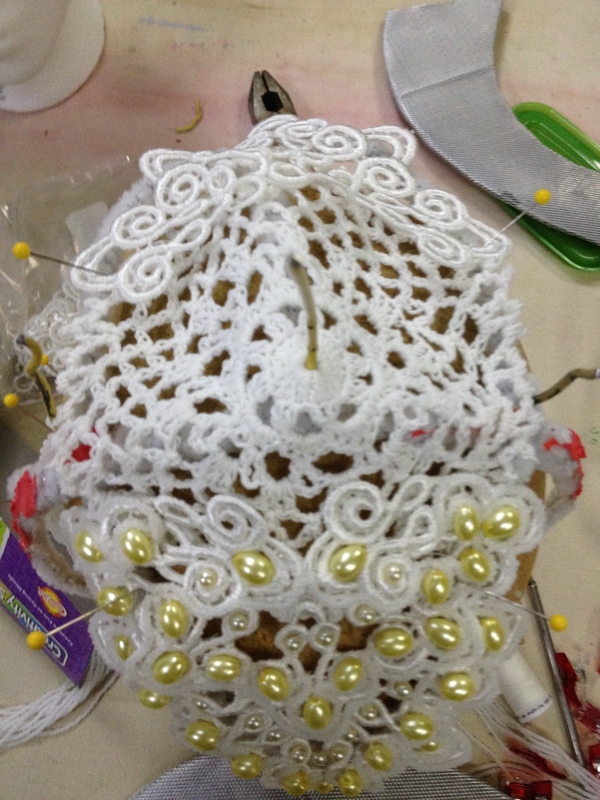 The front will be hidden by the lace applique. I checked to see that my pattern base piece would fit. 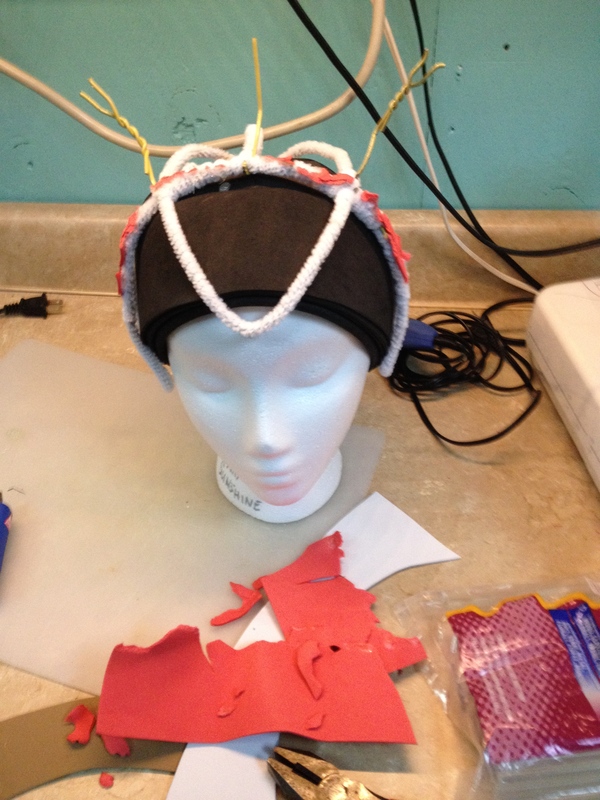 I wired in a couple more sturdy struts to support the hair thing. 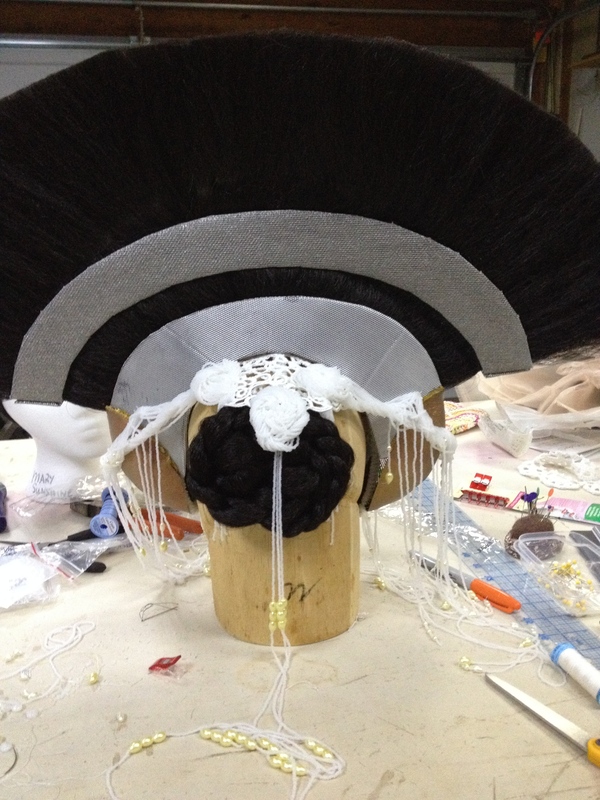 Then I glued the base piece down and called it quits for the night. Got back to work, and looked in horror at what I had done! 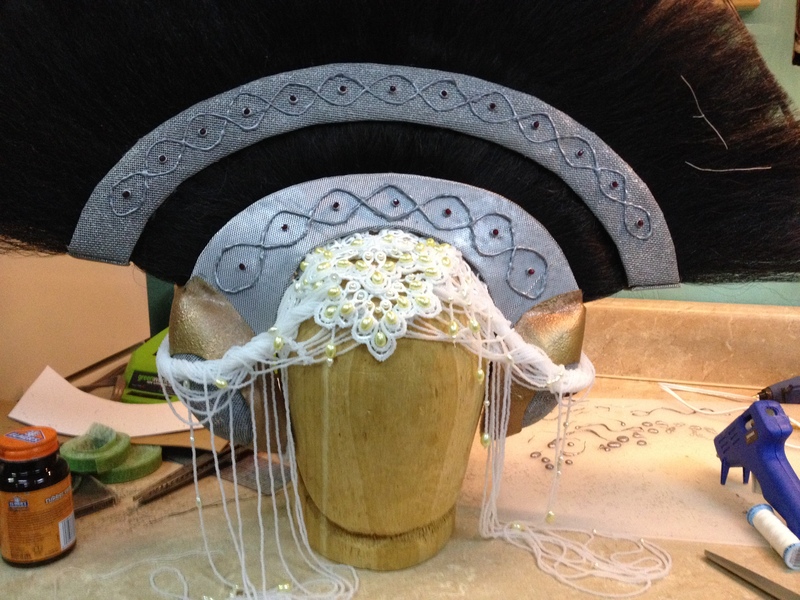 This headdress does not need a base, because it has a frame, and even if it does need a base it certainly does not need a RED base. 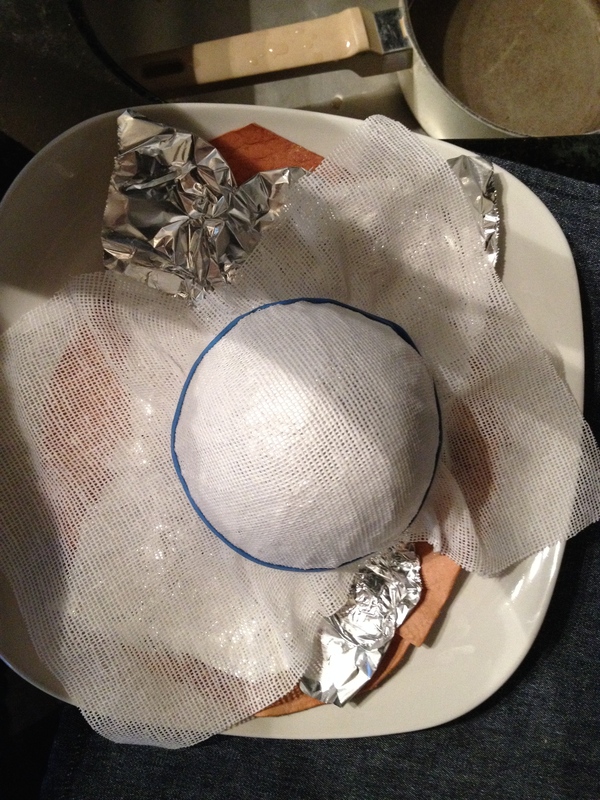 Spend some time extracting as much foam as possible from hot glue and pipe-cleaners. 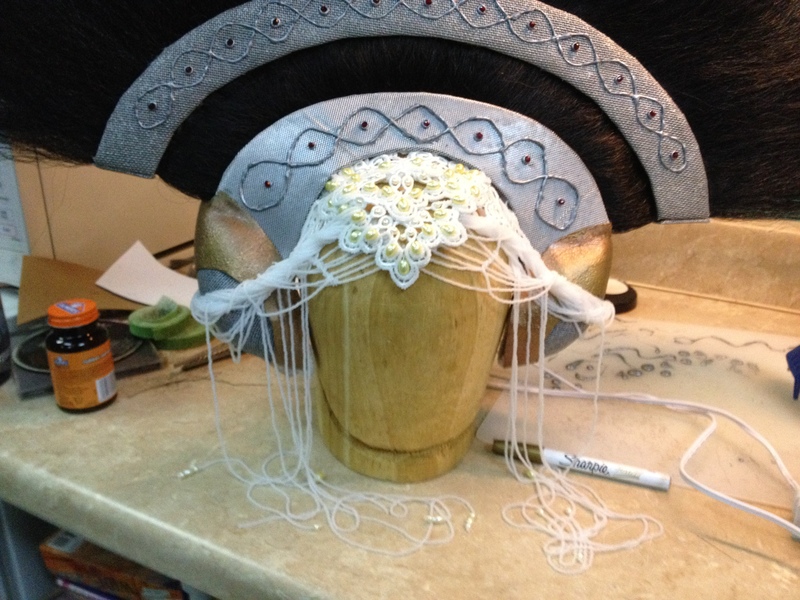 Started tying strands of beads to the front of the headdress – these will be the side sweep over the ear pieces. Because theater has taught me that my ability to tie a proper square knot is only about 60%, everything is double-I-hope-it’s-square-knotted… and the knots are all glued. At this juncture, I am (foolishly) thinking the front looks about done and it’s time to sort out Those Ear Things ™. I have a few requirements for these: they need to be comfy against skin should the contact it, they need to be flexible enough to be reshaped, they need to have a structure that allows them to maintain their shape, and my client needs to be able to hear. No bigs… Right? I thought I would be forming this wire mesh over something to create the infrastructure. That proved tragic. It’s capable of penetrating human flesh in a variety of ways, and it tears. (Yes, the package does have a warning. I just didn’t think it applied to *me*.) 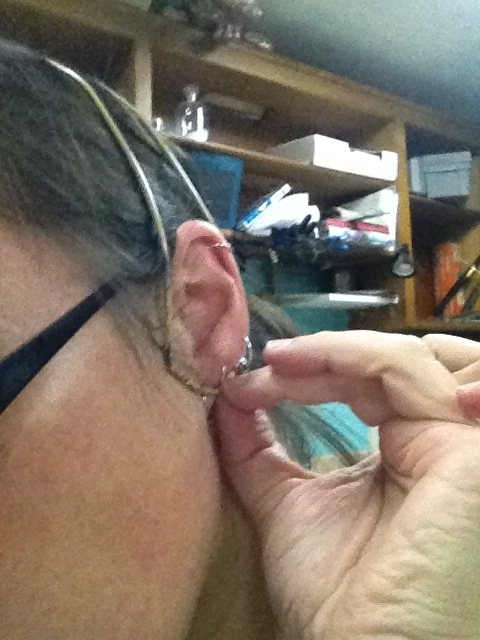 I can use it for the mesh bit of the ear thing, but it can’t get close enough to the face to provide structure. After several unsuccessful craft and hardware store raids, I found these paper-mache “ornaments” at Michael’s. They are the right size with a little surgery. 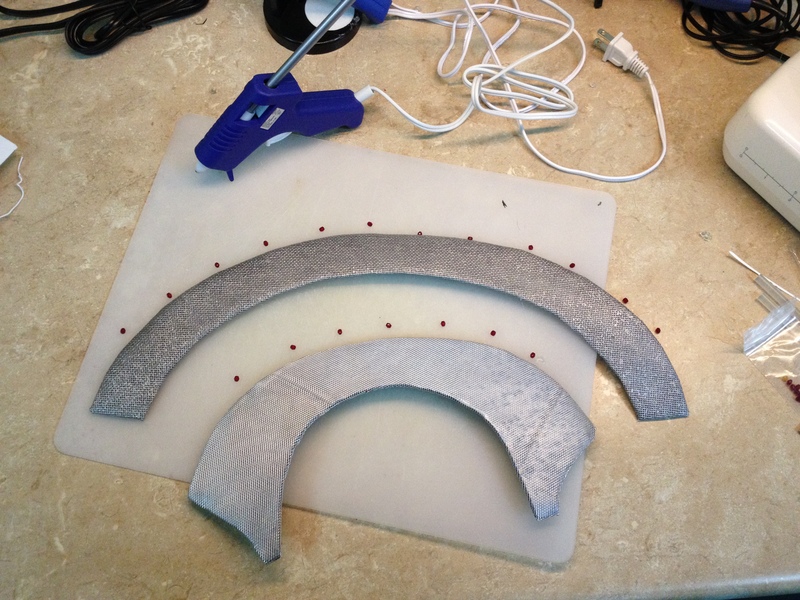 I’ve got a craft foam template of the lower “metal” portion of the headdress lined up with the supported ear thing (not yet cut for metal mesh). I need to mark where the two meet so I can get rid of the extra craft foam. 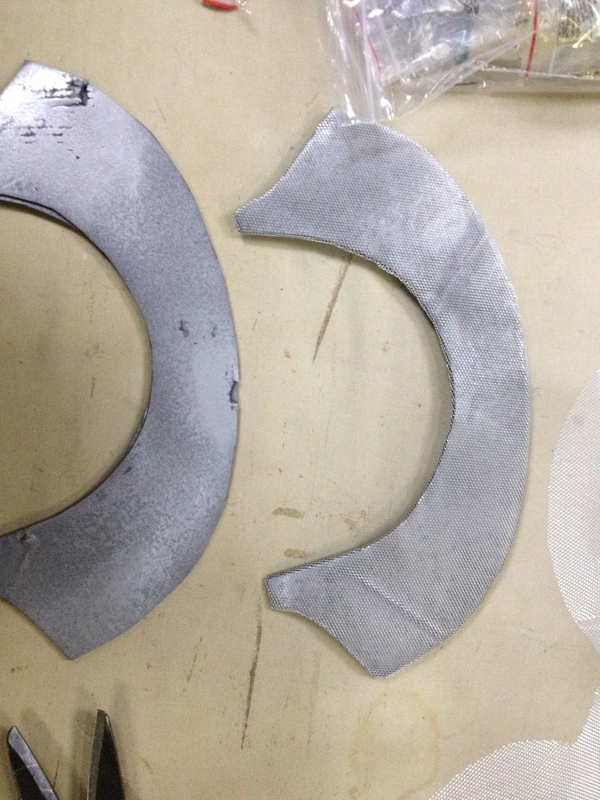 A careful look at the original reveals that the “metal” arch cuts in to the ear thingies. 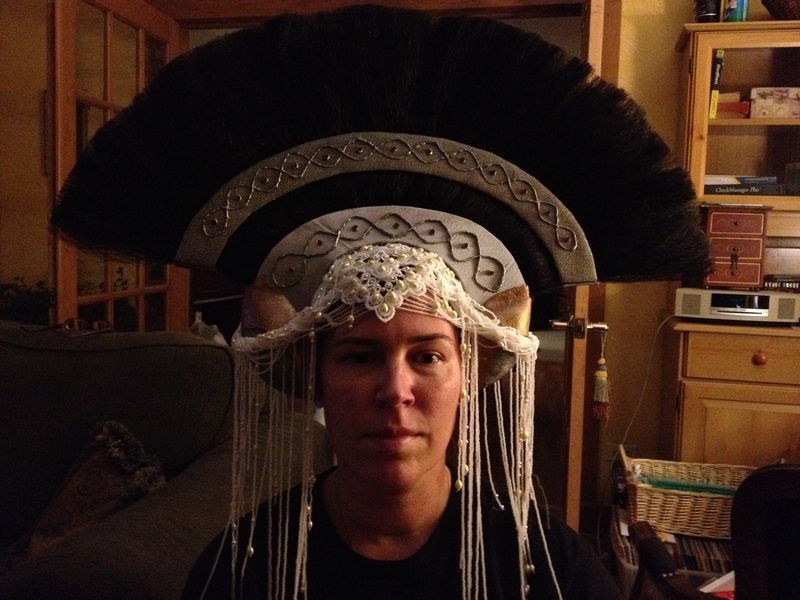 This is oddly key to getting the proportions of the headdress to not look off in that way that you can’t immediately put your finger on. I am now ready to rattle-can a bunch of bits so that they look the right colors – the ear things have to be gold,and the “metal” has to be silver. Spray paint is a tool I use a lot, with a very sophisticated safety spray setup (ie, cardboard box in back yard). 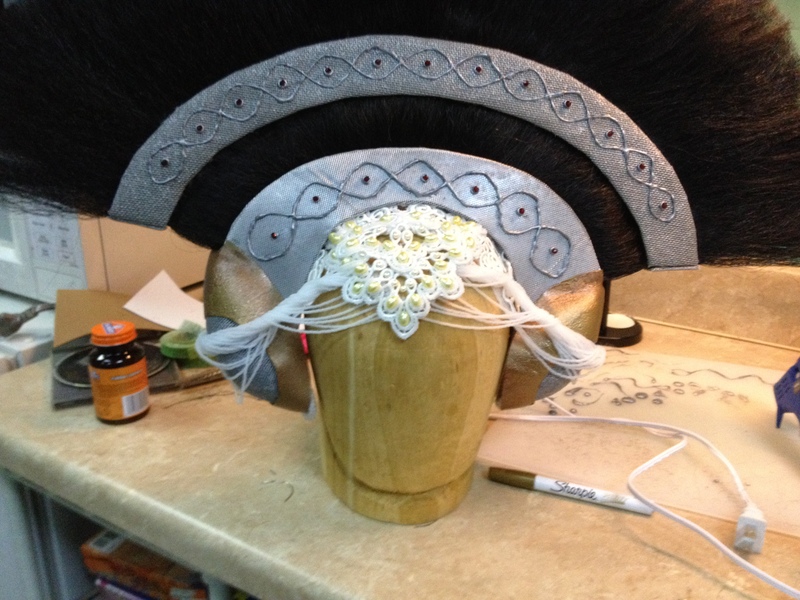 I’ve also made a back lace bit for the headdress. My plan is to connect the two with some crochet chains. 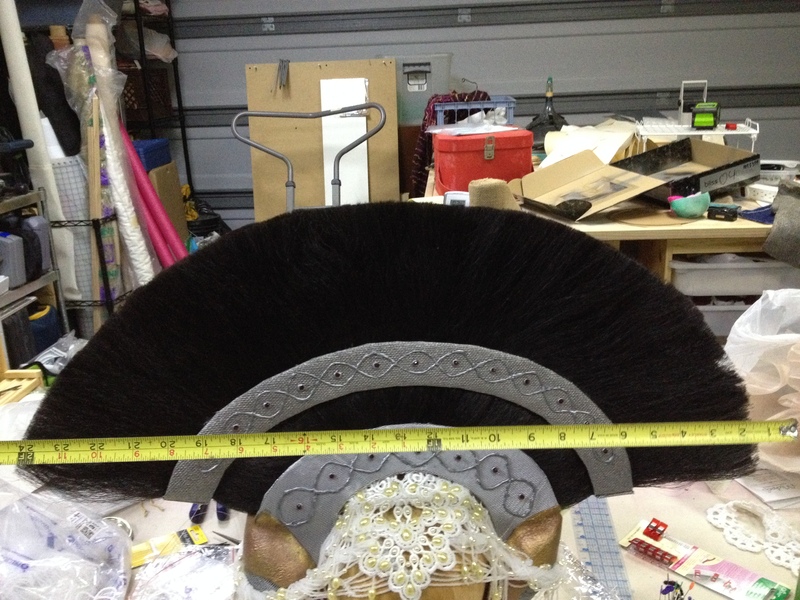 You can’t tell easily in this picture, but the side supports coming up from the top of the headdress have been getting progressively shorter, as missa has been working out the implication of concentric arcs and radii. Specifically, the tops of the side supports are waaaaay to far apart for me to get a base with “sleeves” for them on top of them unless I assemble the two halves separately, then find some way to fix them together. This was not working. I tried, but I couldn’t sort out the hair situation. I seriously over-engineered that. Unfortunately, wind kicked up before the paint dried. I now have some unintended distressing. I wasn’t too worried about that, because my plan was to wrap then in metal mesh for better depth (left – before, right – after). I put the nicer looking one in front, though. I mean, it seemed like the thing to do. 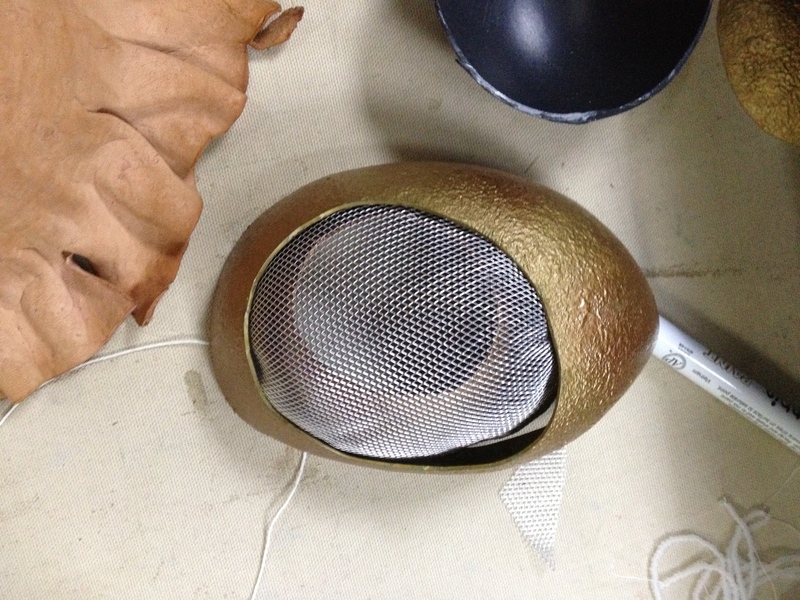 The spray painting process made the plastic ball portion of the assembly curl a little, but that wasn’t the problem. 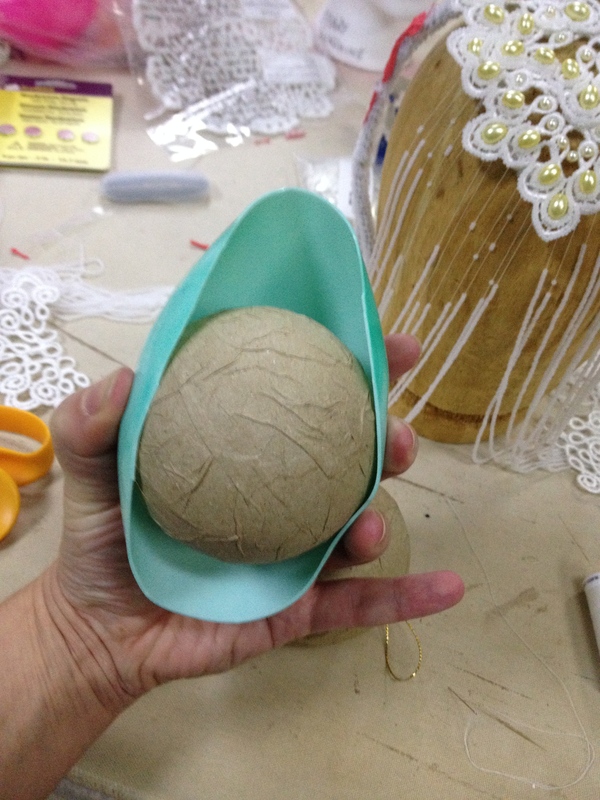 There was no adhesive in my garage that would bind the plastic of the ball to the plastic of the thing inside the paper-mache. I didn’t want to use hot glue and risk melting the plastic, and fellow costumers, when you meet plastics capable of shaking off Loctite, E-6000, AND Liquid Nails, you have met two plastics that do not want to be friends. AAAAARRRRRRGGGGGHHHHHHH!!!! WHY, GOD, WHY?!?! 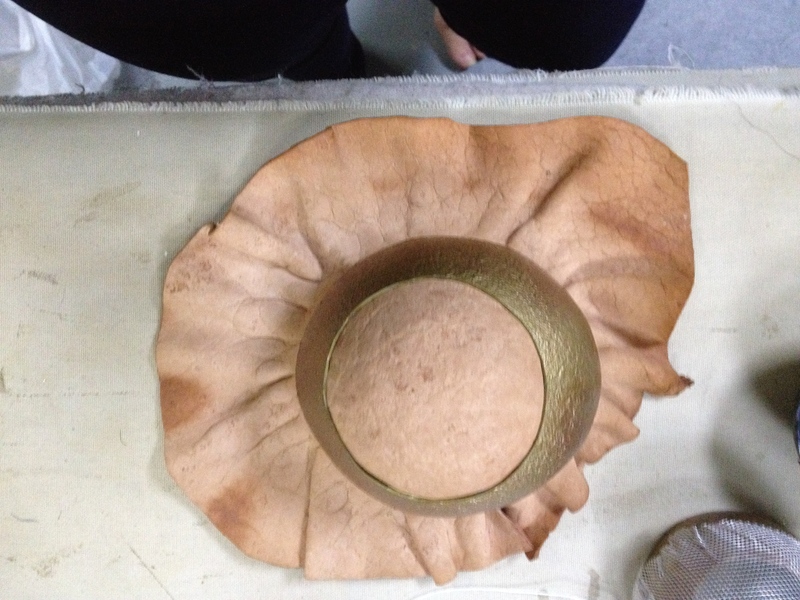 </melodramaticalmoment> Then I remembered that a) I’m a milliner, b) milliners use a miraculous substance called buckram, and c) I’d been trying to make leather goblets a few years back (because me == me, that’s why) and I should still have that plaster mold lying around somewhere. If I do, I can’t find it. I might have gotten rid of it when I realized I’d abandoned that project completely. And suns-a-biscuit if it didn’t turn out to be just about the right size. (Better than the original plan, indeed, because the mesh parts of the original seem to follow a more roundular sort of profile than the egg shaped bit. 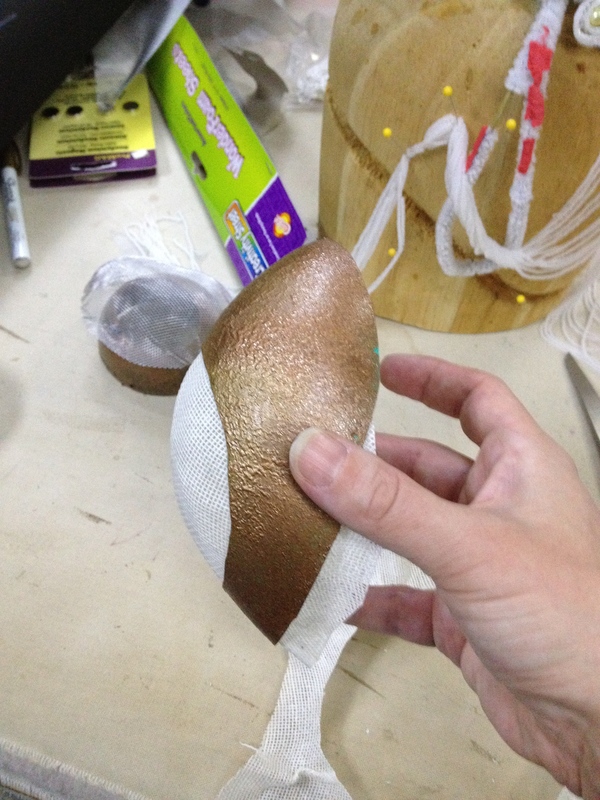 So I wet some buckram and shaped it over the leather, which is dicey because wet leather is reformable. I let it dry. Trimming the extra buckram away, and things are looking good. Things are looking promising. So I spray painted them on a calm day, thus summoning a wind that smashed them against the side of the box, altering their shape. But that wind happened when I was inside, so I didn’t find out for a while. I was busy realizing that I need to cut two of this large upper “metal” band out of foam, spray them, and cover them in metal mesh. 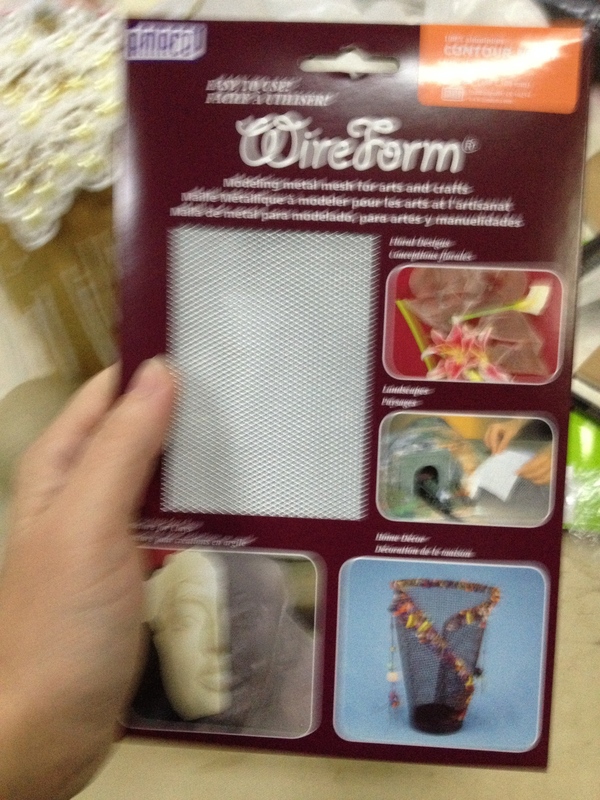 But I don’t have enough metal mesh. Which would actually have been fine if I had still be house-sitting 5 minutes from a Blick Art Supply, but was surprisingly un-fine with me being home. Oh, cruel irony…. No one in my neck of the woods seems to stock this. 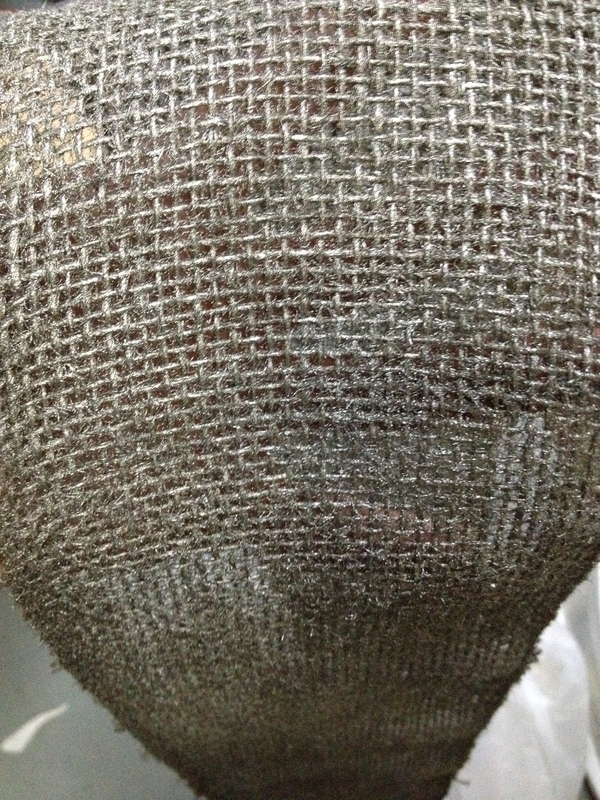 I tried stray painting burlap, the closest tight-grid pattern I could find. The spray catches on all the little fuzzies and makes an unfortunately heavy texture. This is a problem I will be solving …. not now. 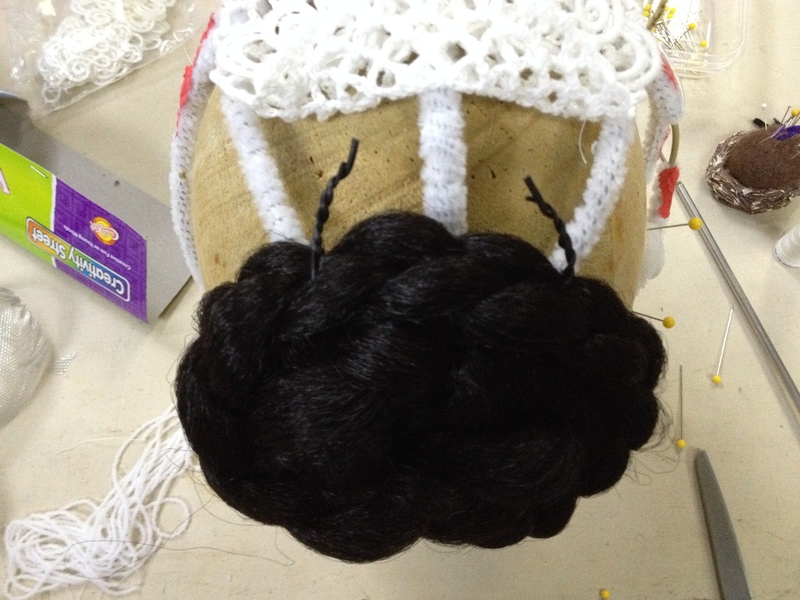 Remember that plan about crochet-chaining the front and back decorations together? 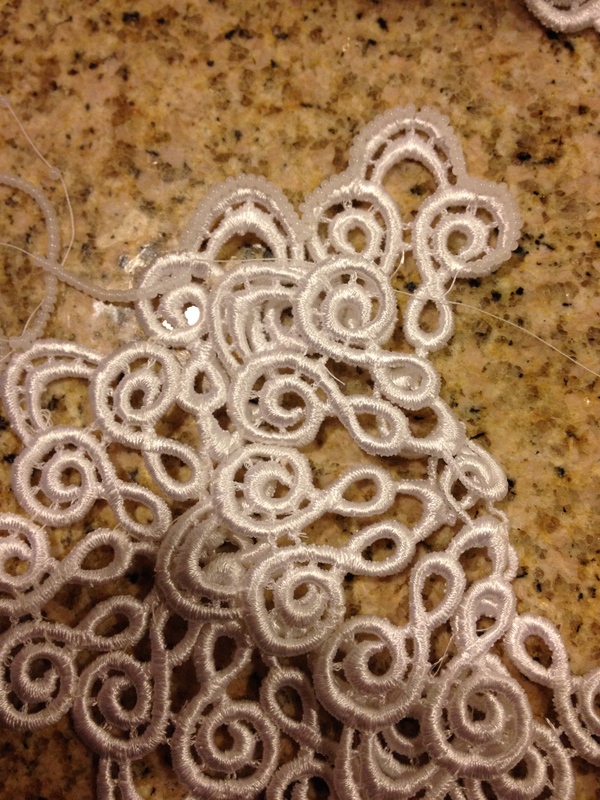 That was taking WAAAAAY too long, so I bought a 1$ doily at Michael’s and cut it to size. 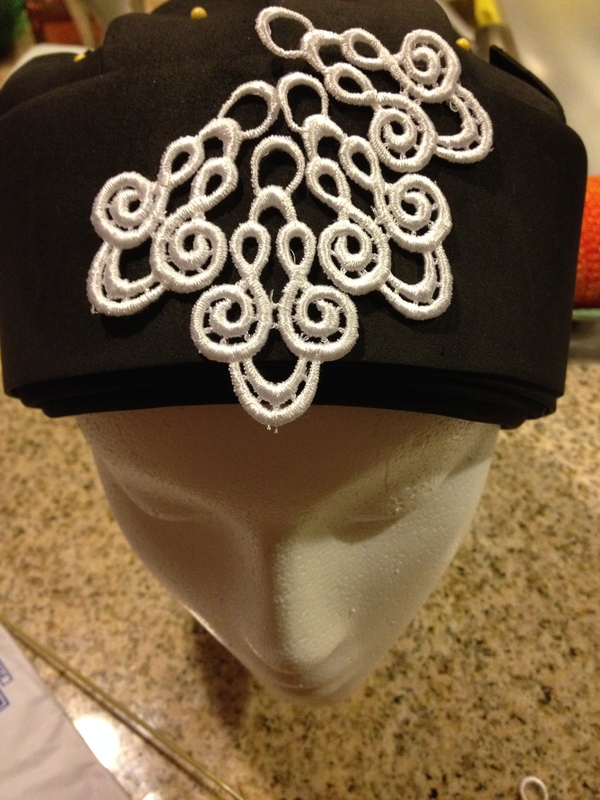 The appliques were sewn to that. Then there’s the hair part. This was the only part of the piece where I was convinced I knew what I was doing, so it was left till the end. Queue ominous music…. 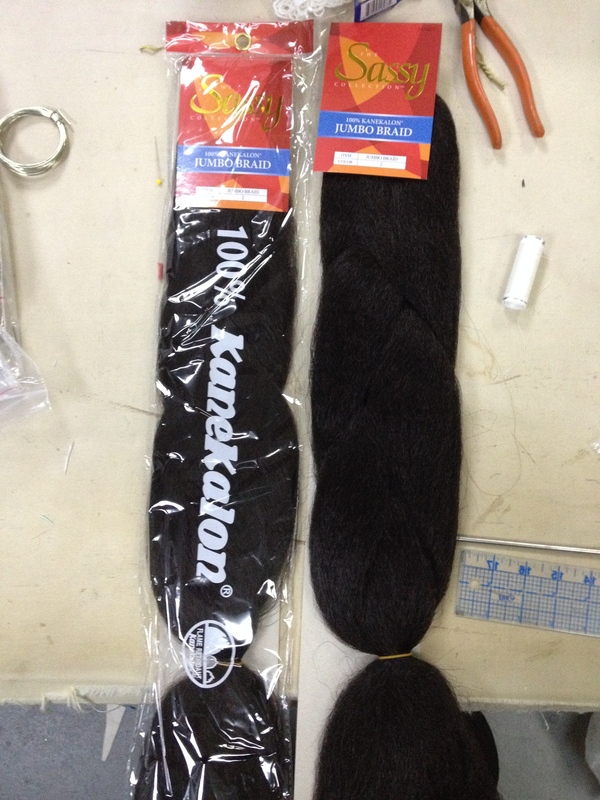 I have four hanks of Kankalon fake hair. You can buy this at a Sally Beauty Supply or a similar source that caters to people who do other people’s hair, or do non-standard things to their own. I want to fan these evenly over a craft foam base. There’s trickiness involved in getting this to work. 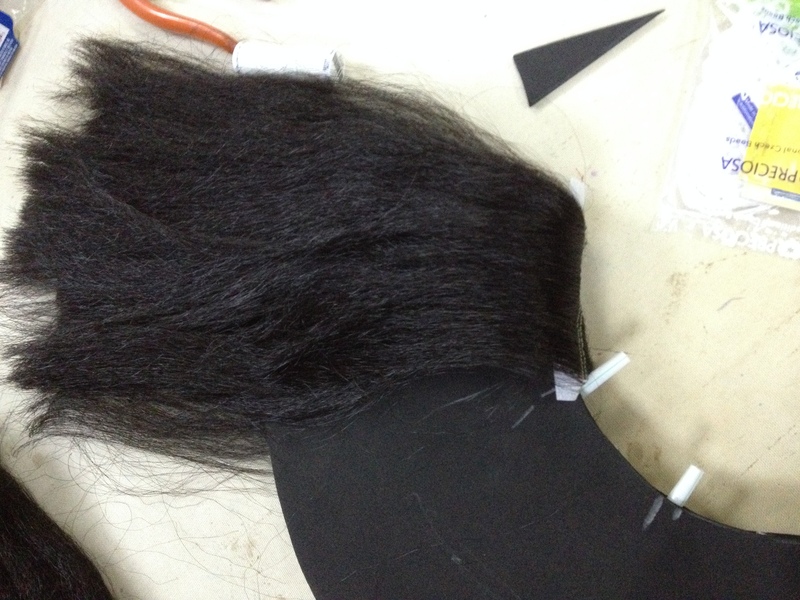 I cut the hanks of hair in half. 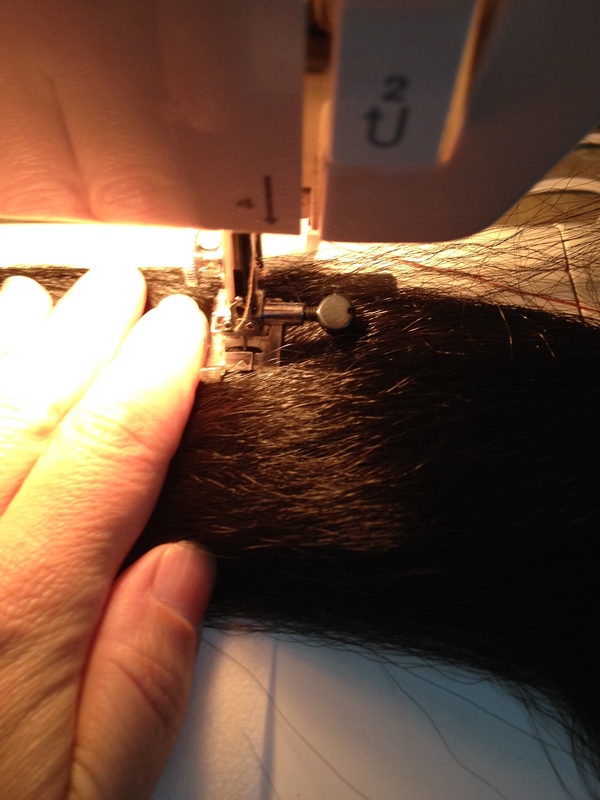 I’m sewing down the middle of each half-hank, with a strip of interfacing between the hair and the machine. 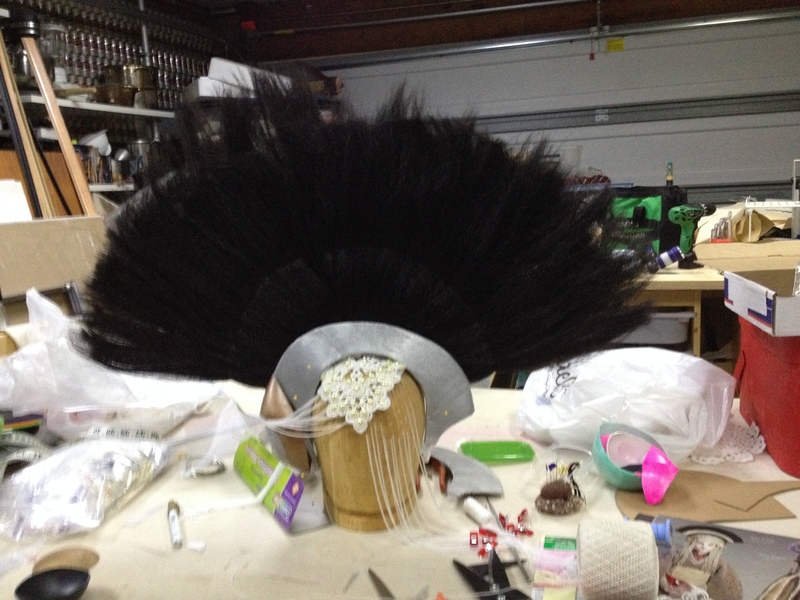 These get draped over the form, which is two layers of craft foam and a fair amount of hot glue. 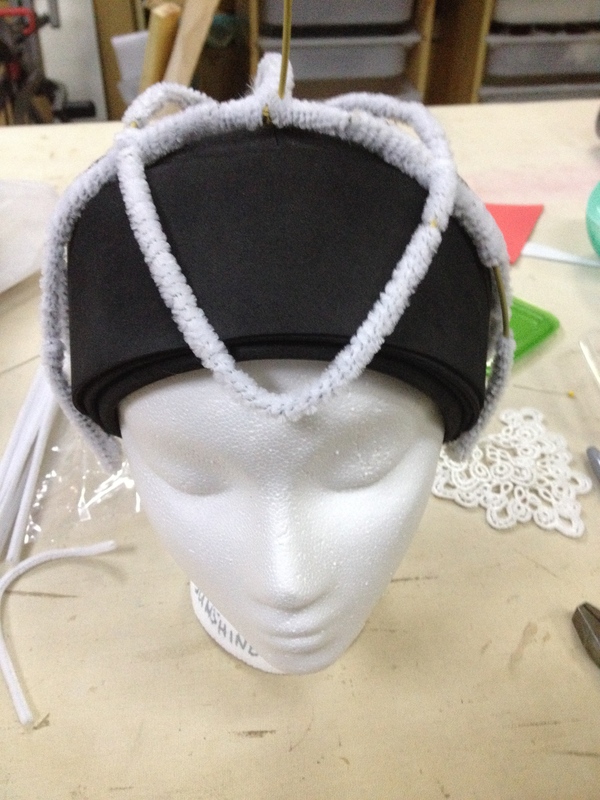 Those white things are drinking straws between the two layers of craft foam, acting as sleeves for the metal supports. I wish I could say I thought that through before realizing that gluing the two layers together was a BAD idea and having to add another rectangle of craft foam to the back. 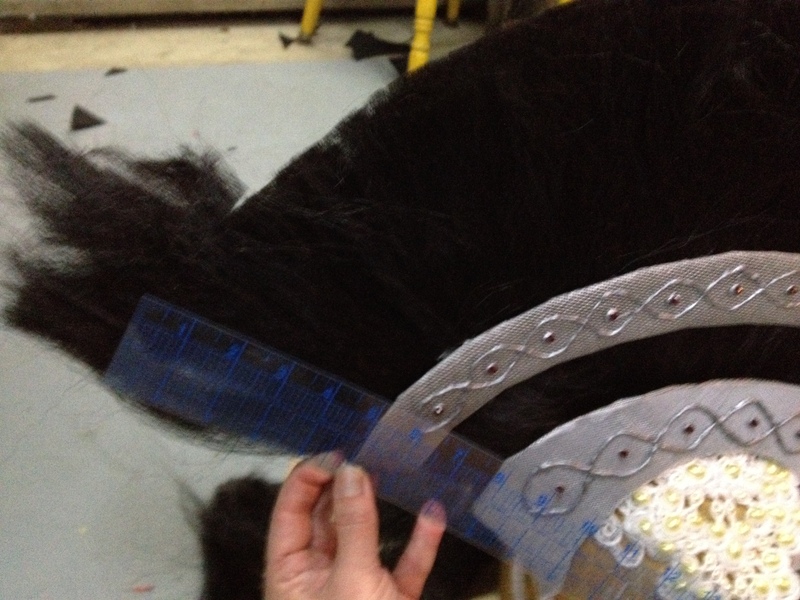 Once the hair is in place, I clip it to the bottom edge of the foam support. Pins will not help here. Using a large hand needle and the time-honored Great Wonking Stabby Stitches method, I’ve secured the hair to the craft foam on both sides, both at the bottom and behind where the upper support will go. Now, when a normal person wants to do something extreme to their hair, they use hairspray, or gel, or mousse, or Elmer’s white glue (that was a punker I knew back in high school). 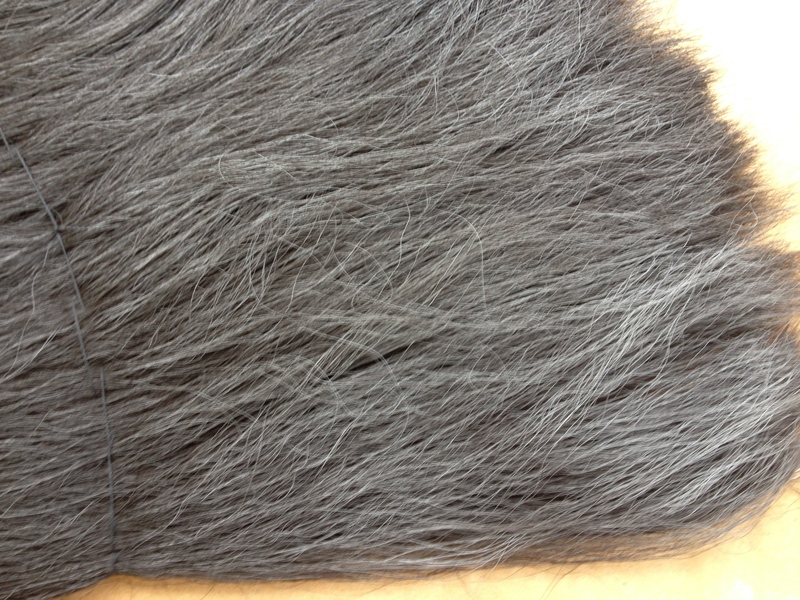 I have a lot of hair here, and I don’t want it to ever break down, so I’m going to use…..
Dum-dum-dum! Acrylic matte sealer, a product which I have used about eleventy billion times on everything from feathers to hats to paper to pottery. I have never had a problem with it. Until that day, when it turned the hair grey as though it had been powdered. 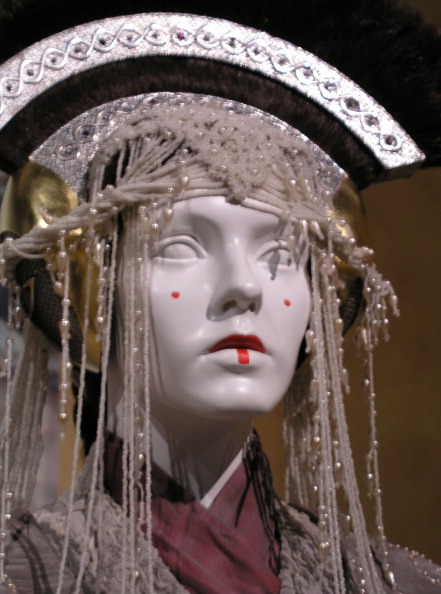 And, I mean, that would be fine if we were doing Amidala de Pomadour, but we are not. Seriously? And I was just … over it. You know that point when you’re out of time and out of backup plans and out of the will to do over, and you throw an f-bomb and decide that if there’s no going backwards, you’re going to go forward with great boldness? I spray painted it. Rustoeum Universal Metallic in an Oiled Bronze. It actually gave a lovely hint of depth and shimmer to the thing. I am now roughly here, and she needs a haircut. This is when I realized that my second line of stabilizing stitches is in the wrong place. I followed the line of the head, not the line of the top of the lower “metal” arc. 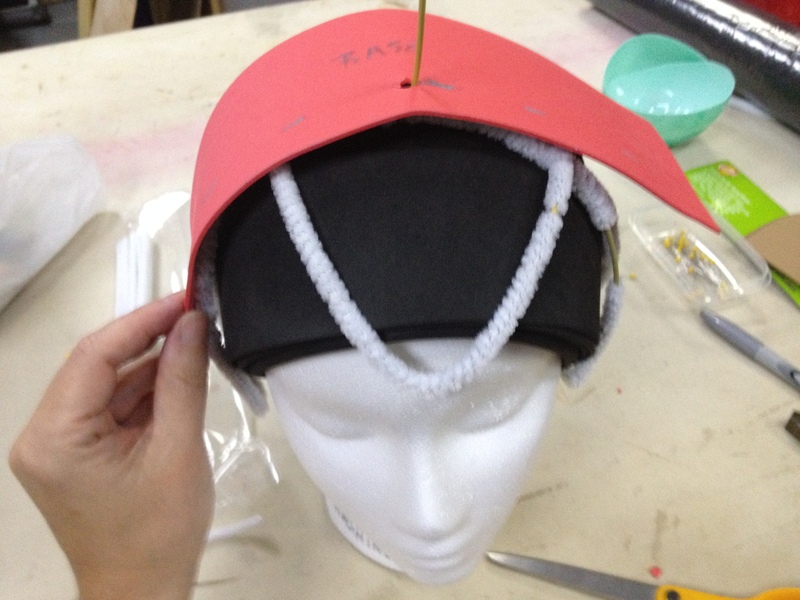 And I clearly knew what I needed to do at some point, because I made the pattern for the upper guard correctly. This is the problem with a setup where you’re working in bits and pieces – it’s too easy to forget your clues. So I redid those and picked the old ones out of the many coats of spray as neatly as possible. Some where impossible. I remembered my clue about the miracle that is buckram again, and spray-painted some silver (hammered pewter, I think, technically). 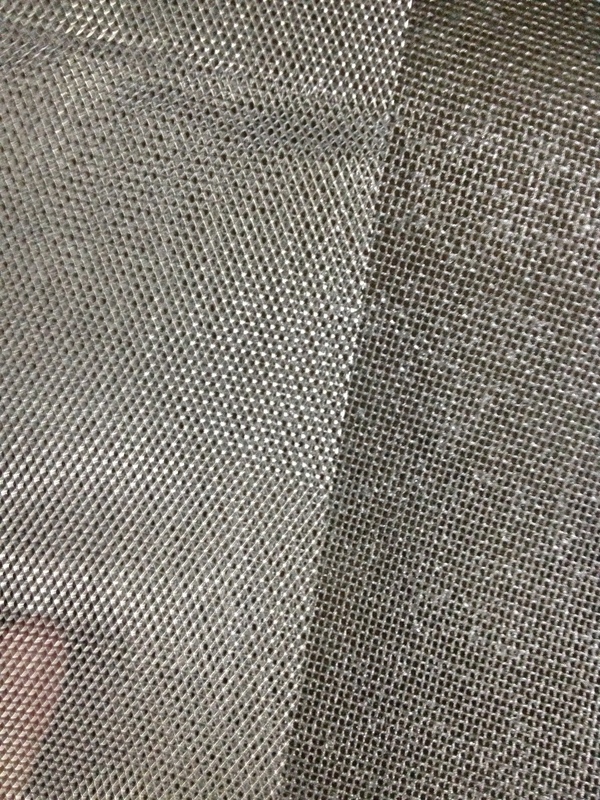 I think it (right) actually looks less cheesy than the metal mesh it’s standing in for (left). I covered the upper guards. I’m all prepped to add some detail work to the guards with the miracle that is silver hot-melt by ModgePodge. I thought. Feeling very clever about myself, I bought a really cheap “disposable” glue gun to use with the metallics so as not to contaminate my less cheap ones. The gun fed so poorly that the silver went backwards instead of forwards. This is not cool, because my hand goes by there. 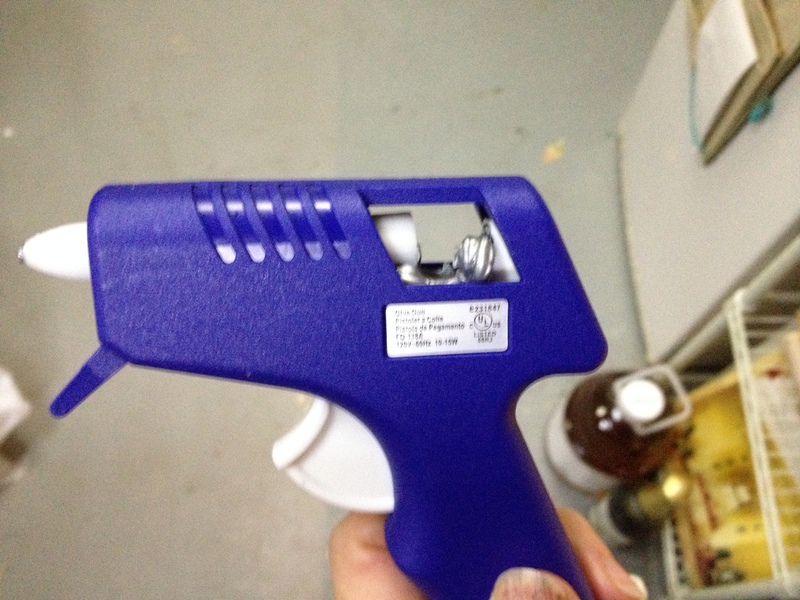 Don’t buy cheap glue guns! I was not injured, incidentally. But between that trauma and the realization that I was giving myself yet another superb opportunity to really screw things up, I started shaking like a leaf. I seem to do that these last few years when I get really nervous. It’s just not helpful. 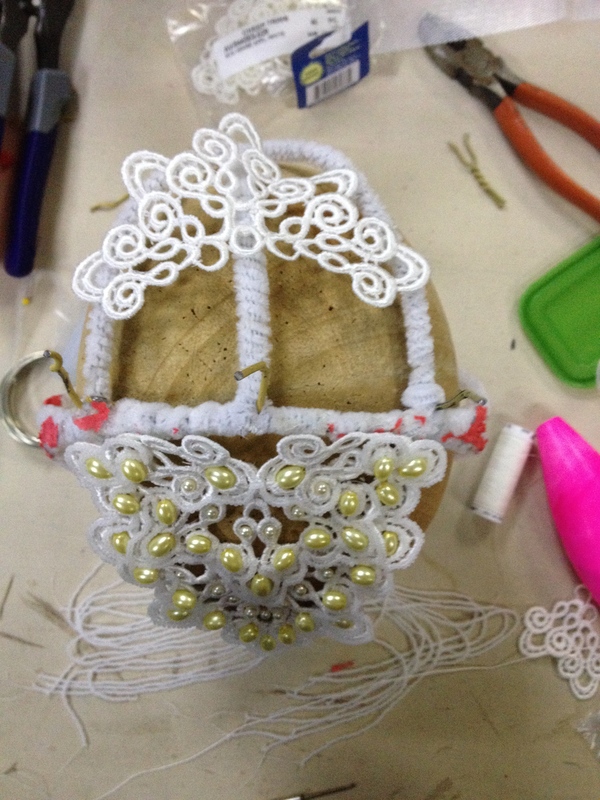 So we have some somewhat dodgy glue-gun work. It’s better than it was on the first go-over. The guards were hot-glued to the hair. I think some of the hair melted together a little. I want to put some hair in the back to hide the back of the frame (a step I could have avoided by using black pipe cleaners for the back of the frame – oy). 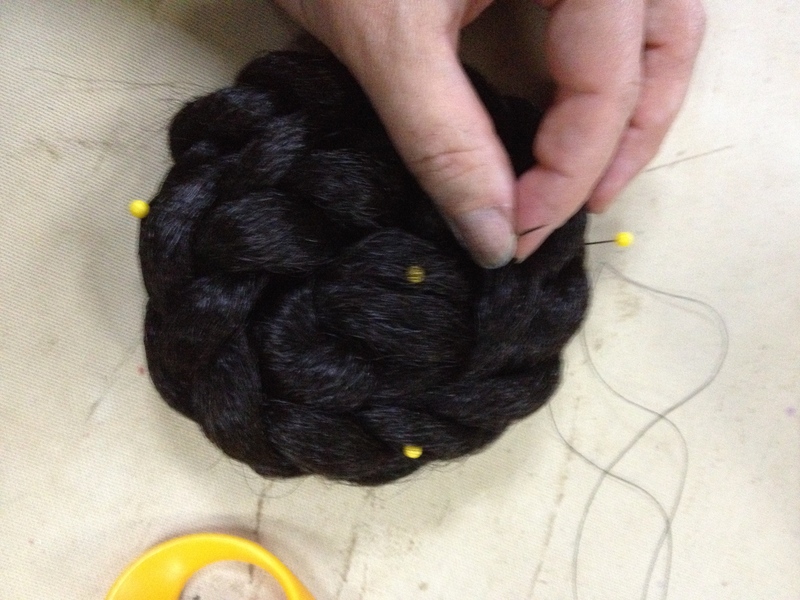 I’ve made a braid, rolled it into a, um, braid-roll, and I’m sewing it together with Great Wonking Stabby Stitches ™. Two of these, in back, look pretty good and change the head proportion in a way that looks right. Except…. 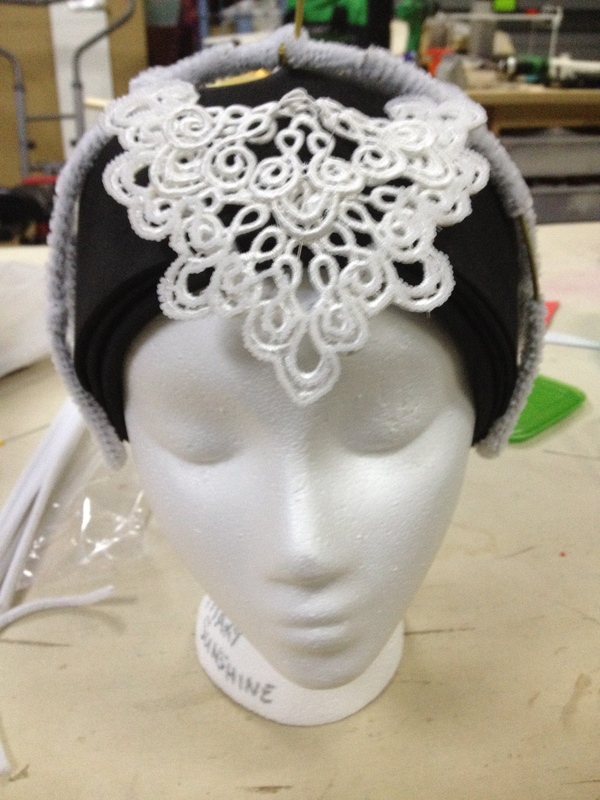 I know Stephanie has a hairpiece on order, but I don’t know where or how it will attach and if it will conflict with my headdress rig, so I did a little defensive construction and attached the double-bun with black twist ties. I always save those from electronics because they’re such a ridiculously great cheat. 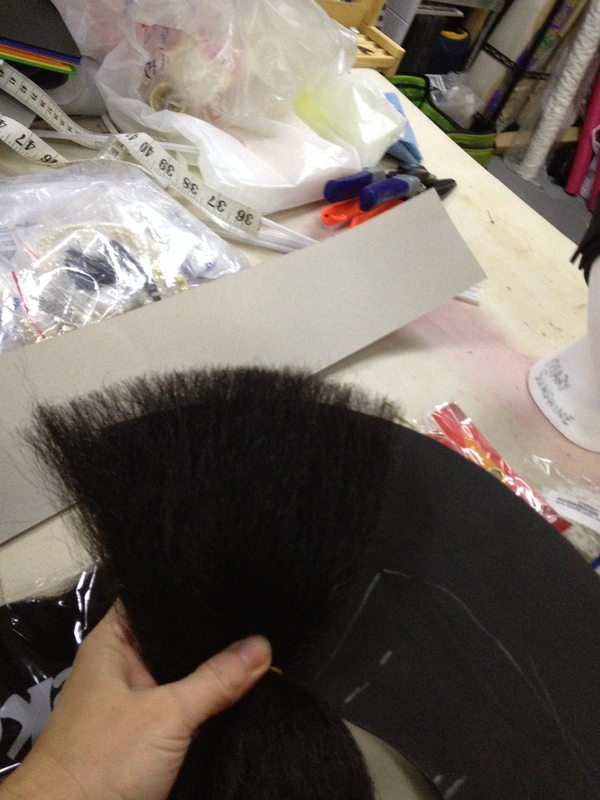 I have no mortal clue how you are supposed to mark a cut line on a giant sealed-and-spray-painted hair construct. I just went along with a ruler and hacked it down. Looking back, the potential for error there was rather enormous. 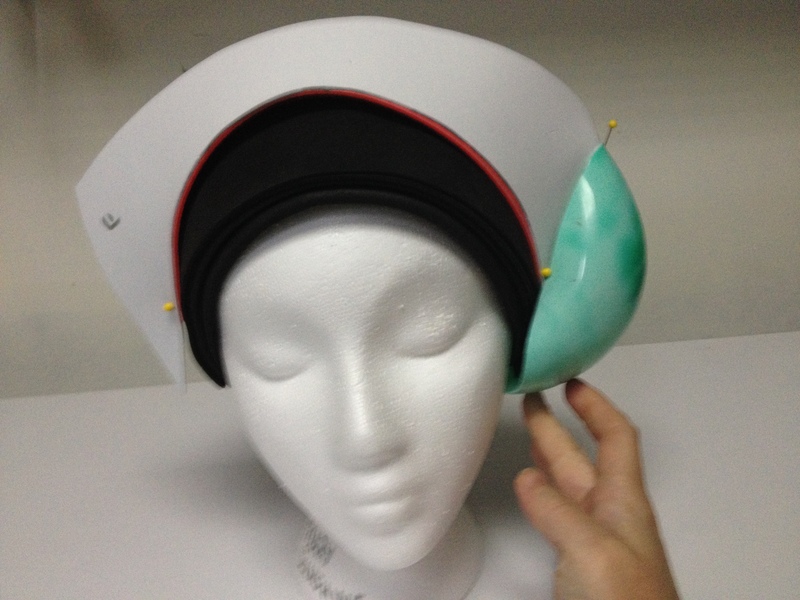 The ear pieces were mounted. Hot glue was involved there as well. 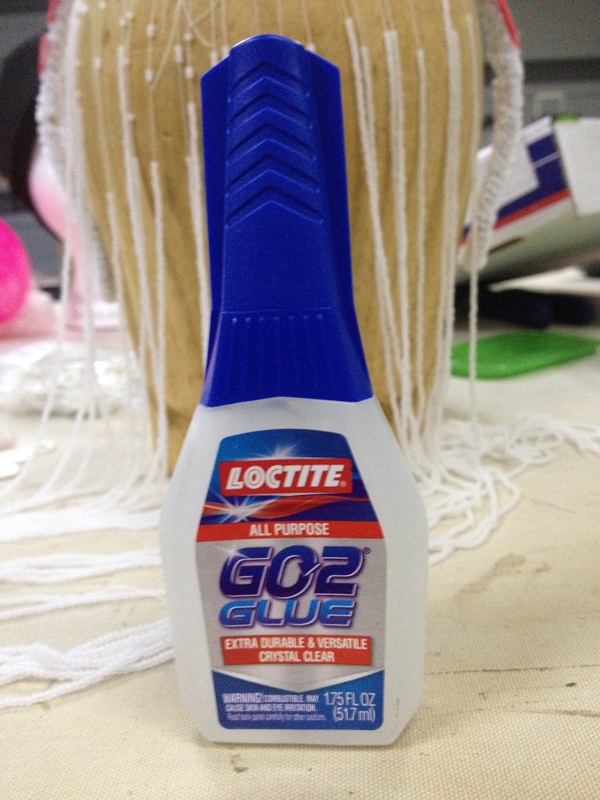 Hot glue, incidentally, makes spray paint separate from plastic. An alcohol marker was involved in the touching up. 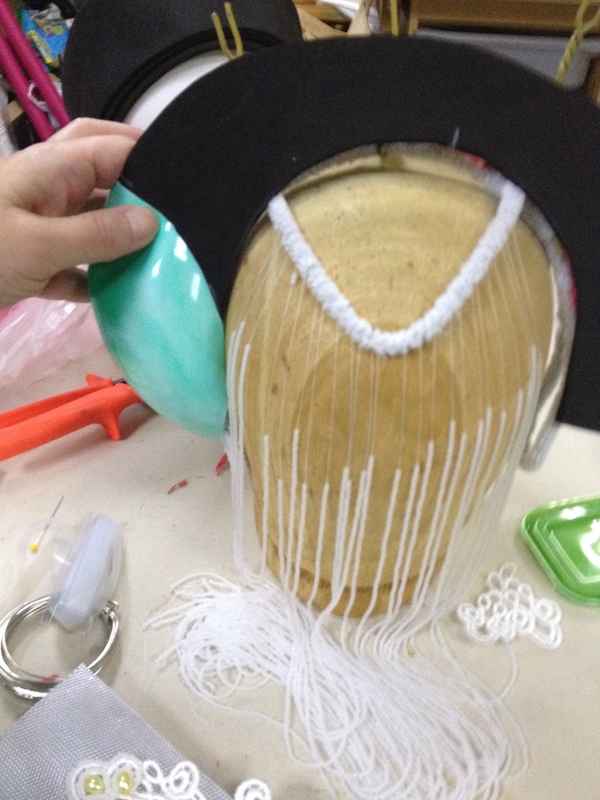 This is looking somewhat meager in the stringy-hanging-beads department. When in doubt, add more beads. And for variety, I decided to add more beads. This is sort of the mix I’m using. I’ve added moonstone nuggets, which I think is really not accurate to the original but they throw a lovely blue flash every now and again. I suspect this is the least of my sins on this piece. In back, for lack of a better plan, I’m arranged the bead ropes into festive rosettes. There’s a little tuck up with a “Gosh, I never thought I’d have to fit my hands into this leetle-beety space between the two layers of the craft foam; I heart my needle-nose pliers” stitch. There’s some long hangsies. I looked at the pictures again later and I think I needed many more hangsies. It is an imperfect world. She’s not as heavy as you’d expect, and she is pretty solid on the head. I’m not saying you should bend over and pick up a penny in one of these, but I feel like walking is an option. If, for some unknown reason, you need to store (or ship!) something with this much standing hair, I really recommend keeping it supported with some cardboard and some clips. It lacks a little for class, but it’s better for the hair. I just realized, scrolling through the pictures, that you can watch the pile of things on the back work table growing and growing. Le sigh. But would anyone believe me if I tried to make it look like I was neat and organized about this? 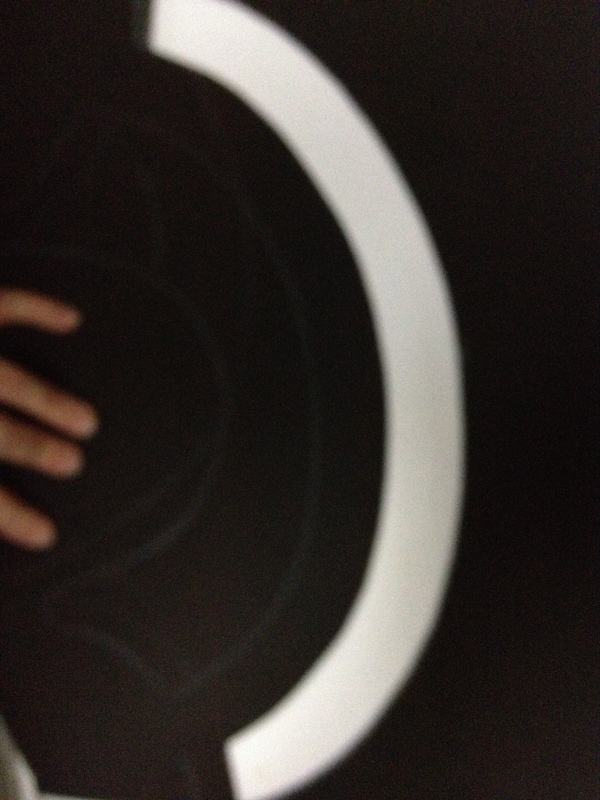 Next And Then I Made It Weird…. Oh, this reminds me of some of my projects! This post was fascinating and made me laugh, and your end result is fabulous. (My workspace looks the same). 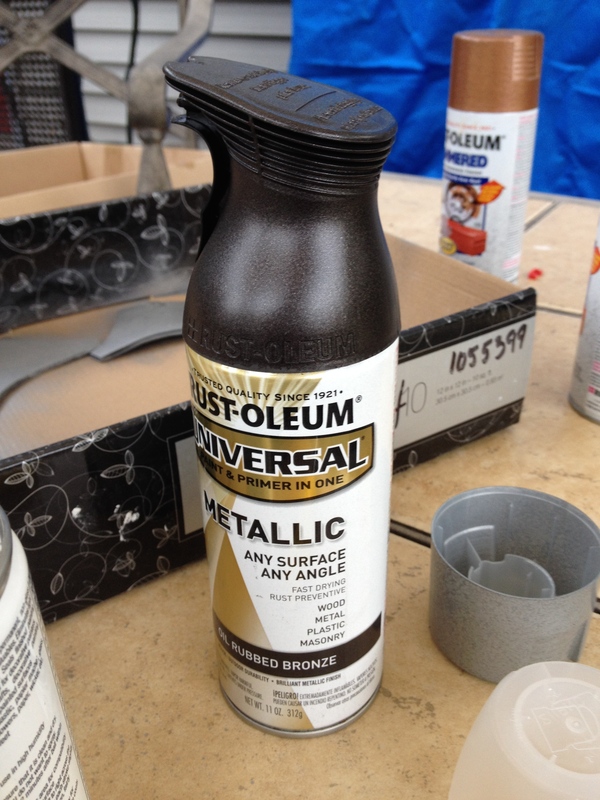 If you ever need to do silver hot glue again, I (happily) accidentally discovered last summer that silver Rub-n-Buff just *loves* to latch on to hot glue. 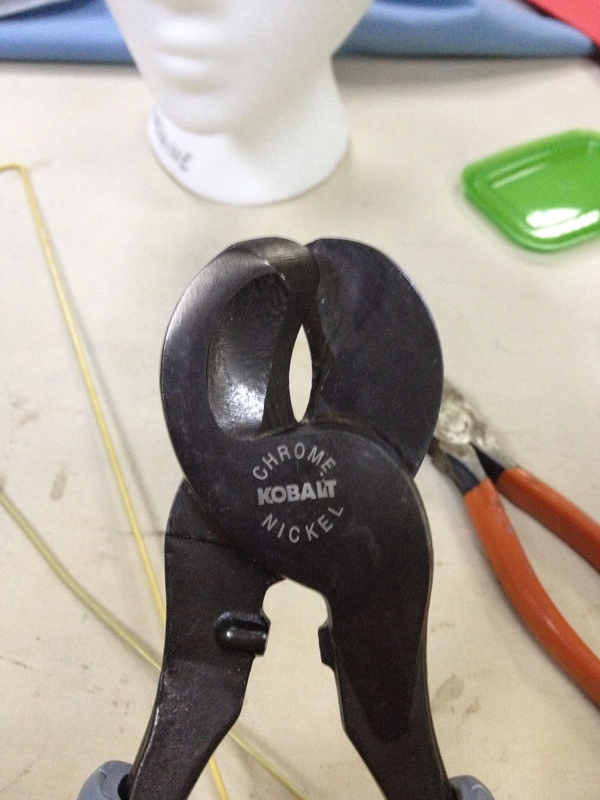 I needed seams on a robot head that looked welded. I went over them with my trusty glue gun, then used the Rub-n-Buff. Perfect! Hi, Daw – thanks! 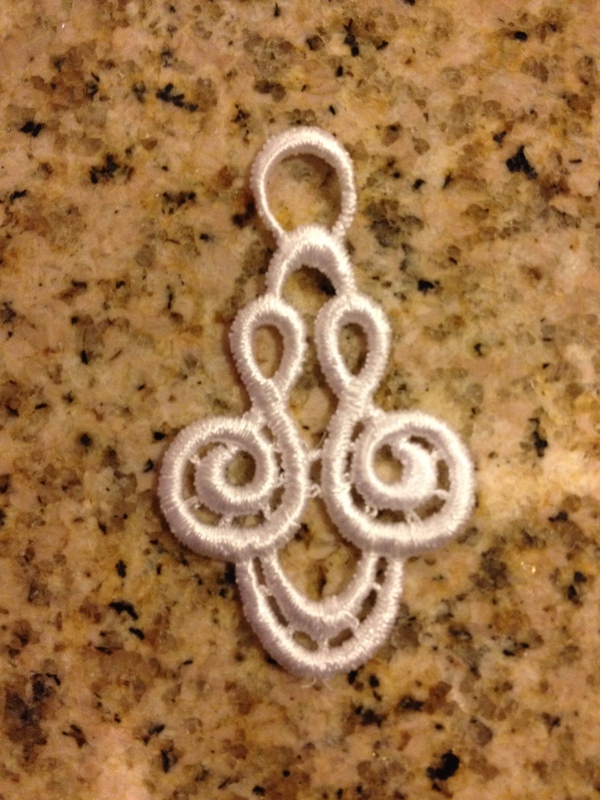 I will tots remember the combo of hot glue and Run-n-Buff in the future. That’s got a lot of pretty aweesome potential! Thanks! Hi, Erica – glad to help! Just coming across your blog…and this bit of fabulousness. And it IS fabulousness. I love how you put in your thought process..es..ez ? I happen to work the same way. It amused me greatly that you do the same. There are at _least_ two of us out there! Woot! Finding all kinds of cool things for my Renaissance Faire costumes, cosplay, and larping! Your blog is amazing! I loved reading through this to watch an artist crafting something amazing! Just a heads up, just be sure to double check cutters to see if they’re made for cutting steel. 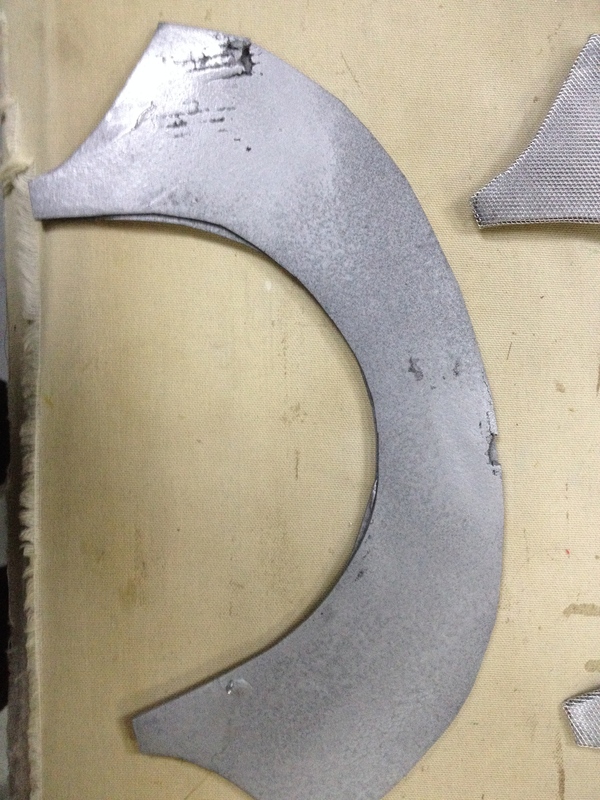 Many times cutters like those are made just for copper or aluminium and other soft metals. Thank you again for the amazing blog! So glad I found this place!